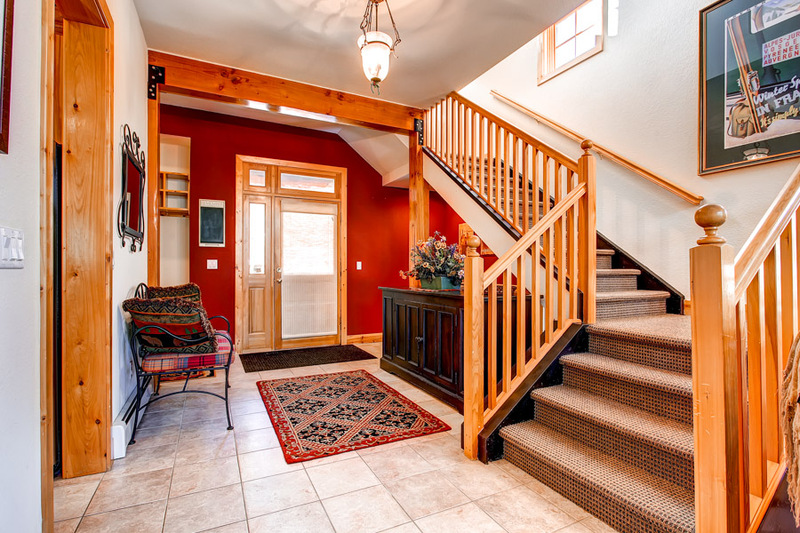 Welcome to White Wolf at Breckenridge! 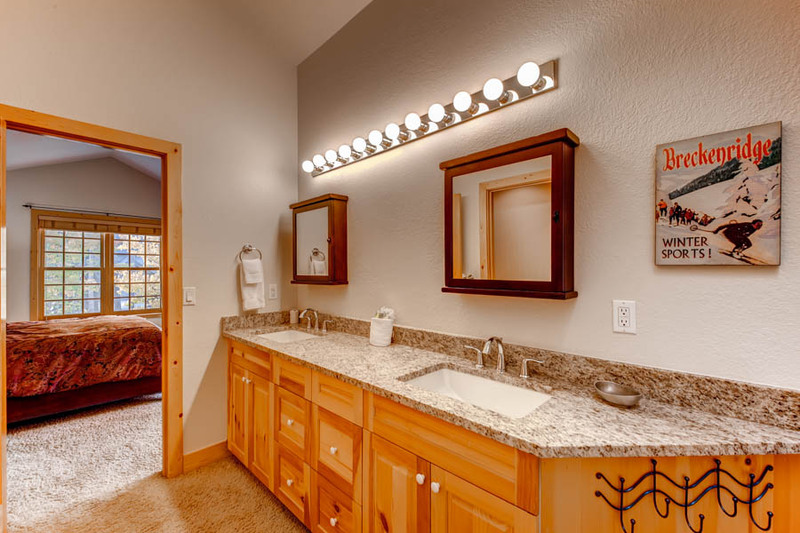 Beautiful and contemporary, our luxury units at White Wolf offer style and comfort — private hot tubs and gas fireplaces in every unit, fine furnishings and décor — in a beautiful wooded setting on Peak 8. 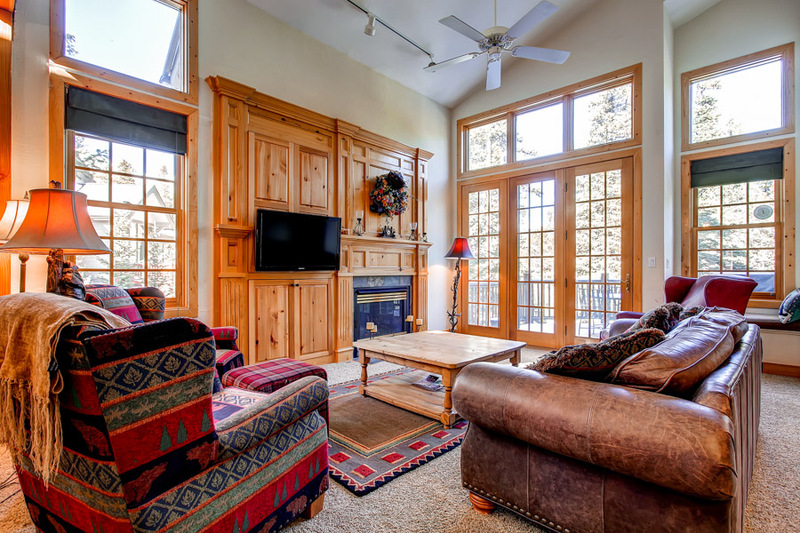 You’re just a short walk to the shuttle to Peak 8 and the slopes, or catch a shuttle to Breckenridge’s historic Main Street for dining, shopping and more. And in the summer, enjoy one of Breck’s nearby hiking trails. 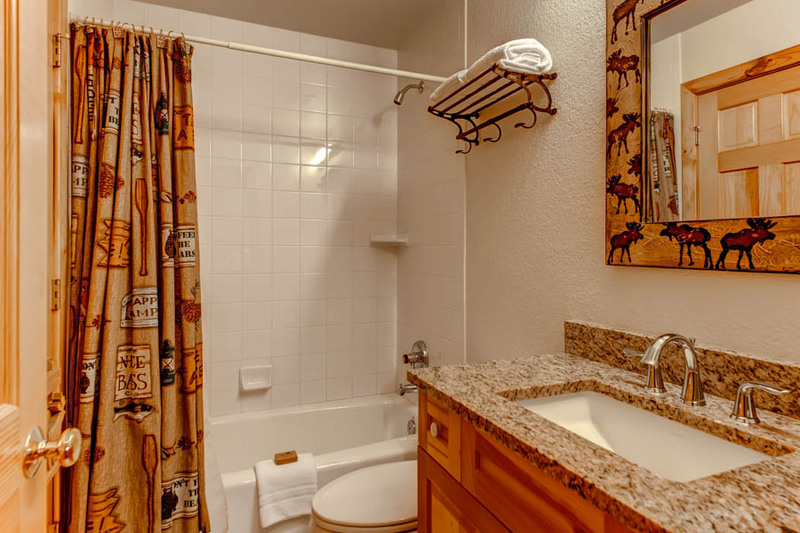 You just can’t beat the combination of mountain serenity, convenience and luxury that White Wolf has to offer. 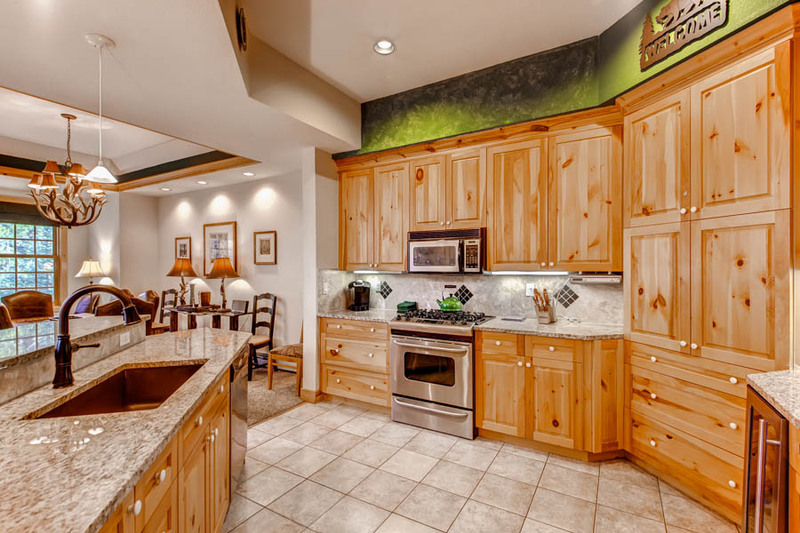 White Wolf 384 is a stunning, high-end townhome. 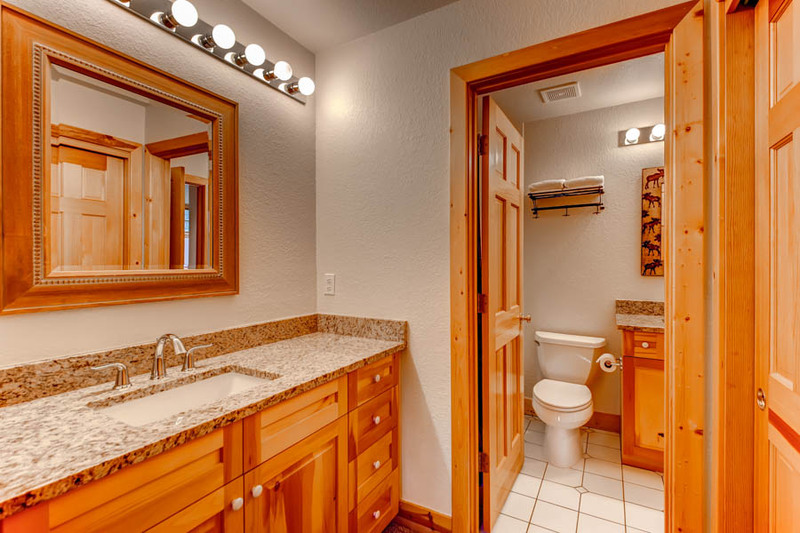 Just look at the exquisite woodwork, classy furnishings and delightful decorating touches, including new granite countertops in the kitchen and all bathrooms. It’s a perfect blend mountain charm and elegant chic! 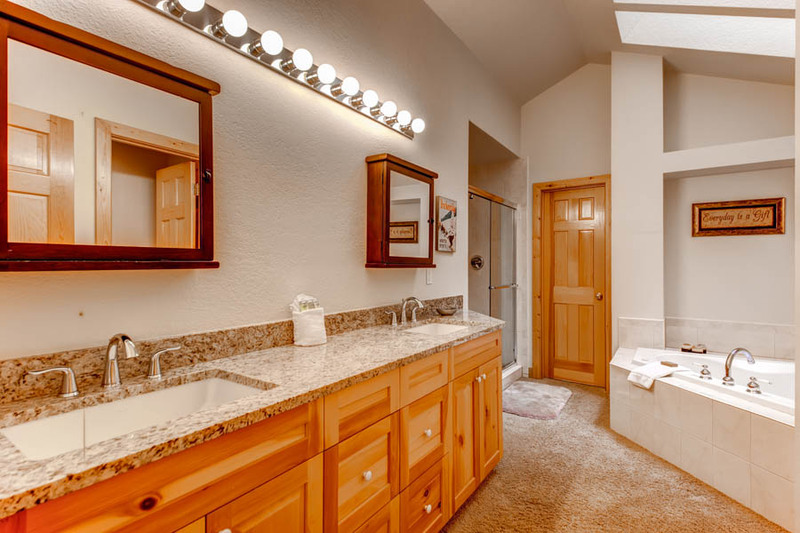 This four-bedroom, four-and one-half bath, 2,850 square foot unit also has a great layout, with plenty of room for everyone to spread out and relax. 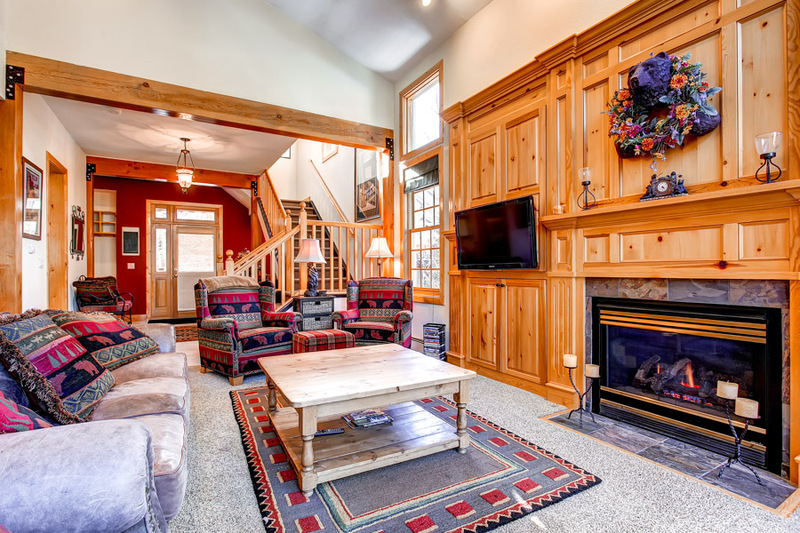 When you walk in the door, you’ll be struck by the beautiful living/dining area: vaulted ceilings, huge windows looking out on the forest, a gas fireplace, LCD-TV and lots of comfy seating. Just off the living area, there’s a large deck with a gas grill and outdoor seating. 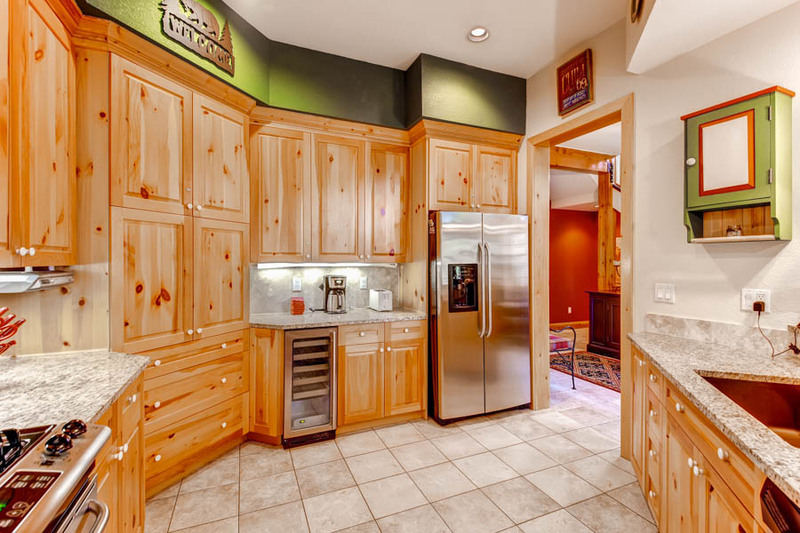 The kitchen is first class, too, with gorgeous cabinetry, beautiful new granite counters and stainless appliances, including a gas range and wine cooler. The dining table has seating for eight, and there’s room for two more at the counter. Upstairs, the head of your group will enjoy the spacious master suite featuring a luxurious private bathroom with a large Jacuzzi tub. There’s another king bedroom and bathroom on this level as well. 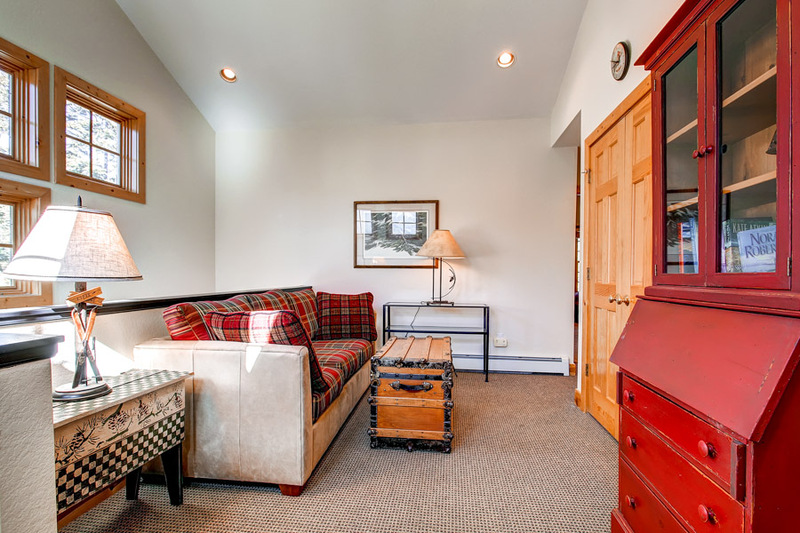 Downstairs, there’s a cozy den/TV room — perfect for the kids and teens — as well as a queen bedroom suite with a private bathroom and another bedroom with two twin beds. 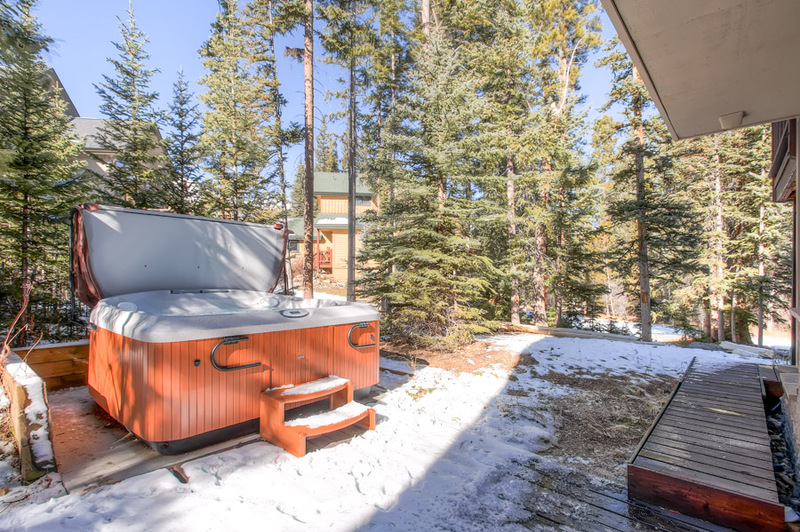 Step out the French doors downstairs door onto another deck and your private hot tub awaits! 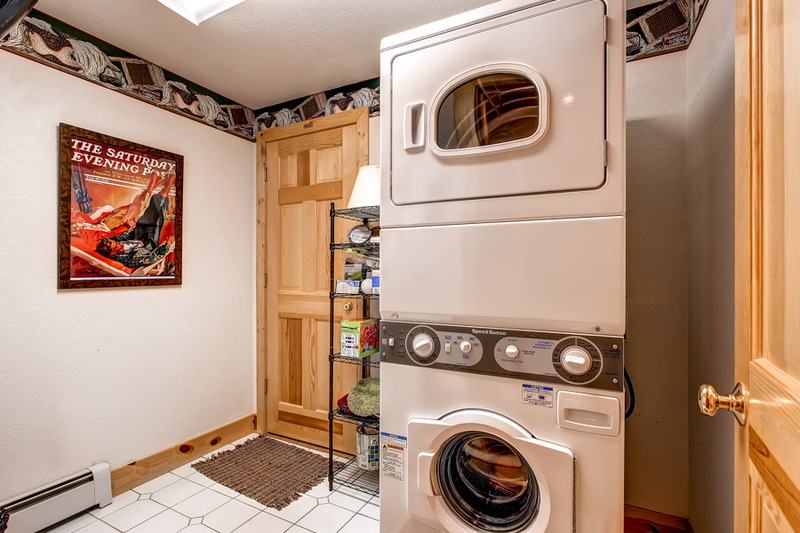 There’s also a large laundry room with a washer and dryer, a heated one-car garage with an additional space in the driveway, and complimentary Wi-Fi throughout the home. 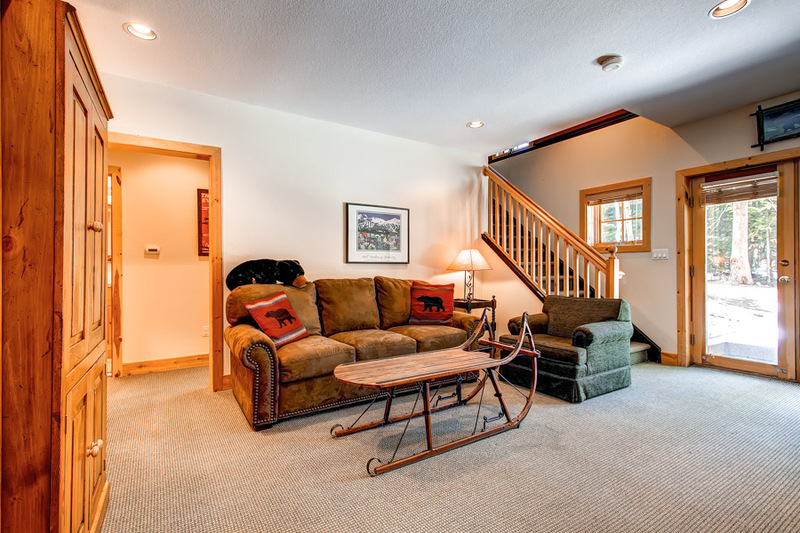 You won’t find a more stylish or comfortable townhome in Breckenridge, with easy shuttle access to the slopes and town. 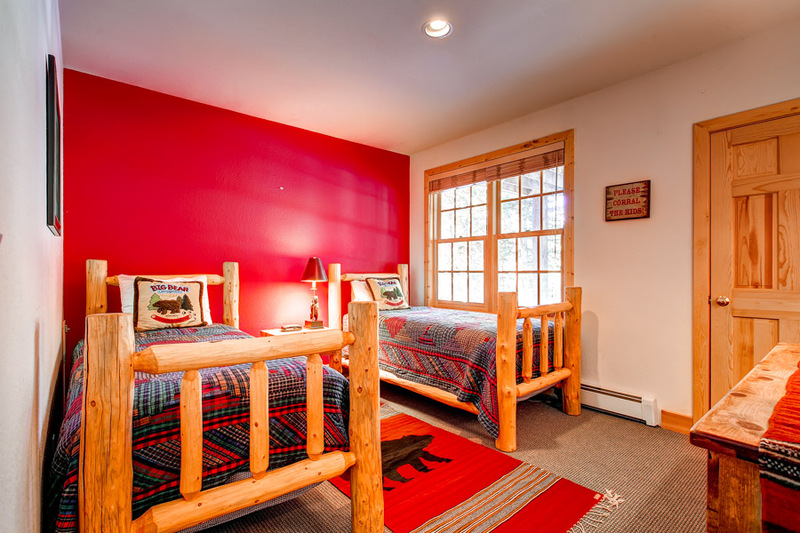 Treat yourself and your family or group to a luxurious stay at White Wolf 384! For large groups and extended families of up to 28, call us for this special offer! 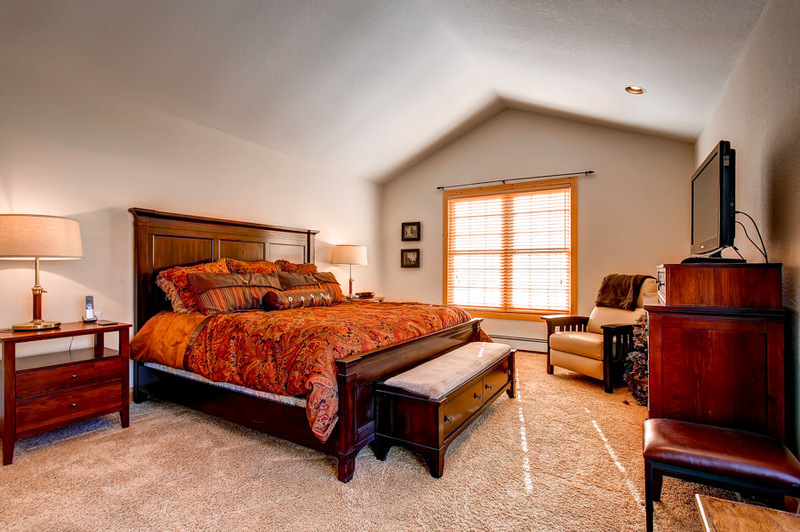 Right next door to White Wolf 384 is White Wolf 392, another fabulous luxury townhome that offers sleeping for up to 16 guests. Imagine booking both of these properties together for your group! We can offer you a discounted package price on both homes; just give us a call. 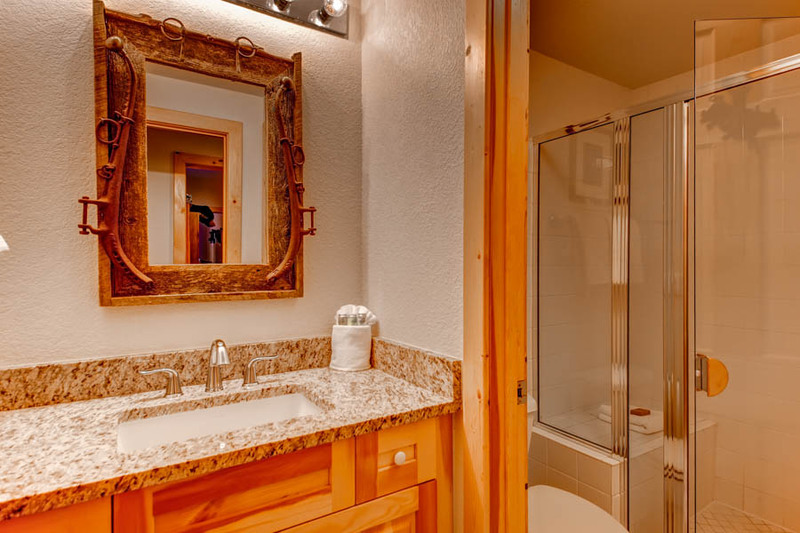 Master suite: king bed, luxurious private bathroom with large Jacuzzi tub and walk-in shower, LCD-TV. Bedroom 2: log king bed, TV. Loft: queen American Leather Comfort Sleeper sofa. 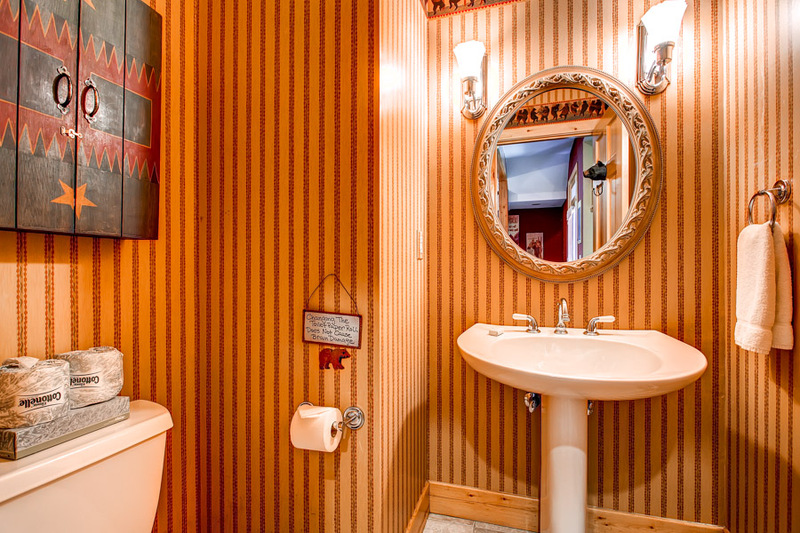 Queen suite: queen bed, private bathroom with tub/shower, TV. Bedroom 4: two twin beds. Parking: Parking for 2 vehicles: 1 heated garage space, 1 outdoor space. Business and Occupational License #45857. We stayed at WW 384 for our Thanksgiving vacation. The townhouse exceeded our expectations and we will definitely consider coming back! Family reunion in the pines! This was a perfect place to enjoy visiting with family members - large kitchen, dining and living rooms, lots of bedrooms and bathrooms! 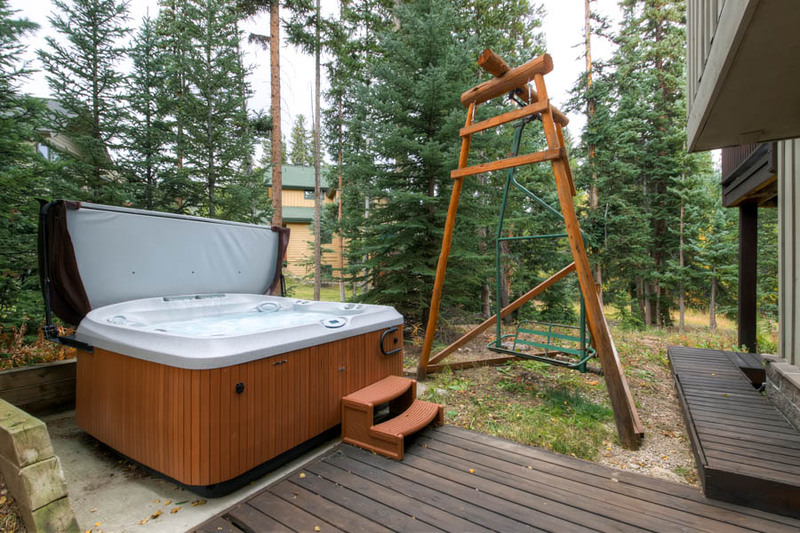 A deck with beautiful views, a grille and hot tub. We will be back! Solid location and house for kids. 50 yard walk to breakfast, lunch and shuttle stop near Nordic Center. Right on the Nordic trail. 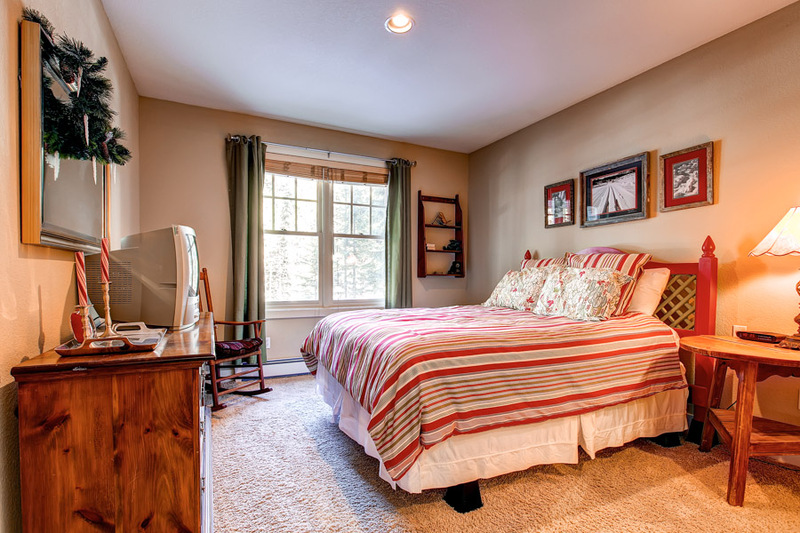 Bedrooms and house were perfect for two couples with kids. Great location, just right for 9 people clean and roomy!! Get townhouse, excellent location! My sister and I brought some family from California up to the mountains a few days. We had four adults and eight kids (ages 6-17yrs) This property is perfect for families, beautifully decorated and was very clean. Perfect place to stay for a mountain getaway. The location is close to Main street but yet sits far enough on the mountain to enjoy the peace and quiet and watch the animals roam- foxes, deer, etc. We loved, loved the home. We will definitely be coming back. The home had everything we needed. Awesome place to stay at. I have already given the information to several friends and co workers. Great experience. Hi Julio, Thank you for the feedback! We look forward to hosting you in the future! This property offered us a very private setting, while providing convenient access to town. Everything you need (and a lot that you don't, but really want!) in this property. Thank you for your feedback Milton. Overall extremely satisfied with this rental. All the guests loved the place! The place was prepared for us including some basics to get us started and toiletries, which was a pleasant surprise. Our family rated the property (and location) an A+. The Summit Mountain Rentals staff couldn't have been more helpful and/or accommodating. Close to peak 7 and 8. Only downside was they did not plow snow out of the driveways. Great place for a family get together! Our stay was great! 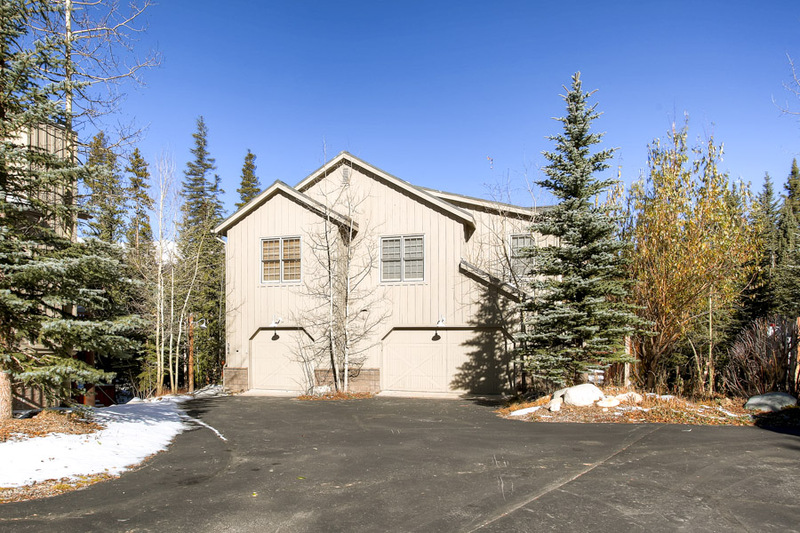 Super convenient location to bus stop to ski area and nordic center. We could have used a few more towels but, besides that, everything met or exceeded our expectations! Great stay - Great experience! We had a great time with tons of snow in a beautiful home. MUCH better than getting a small condo with cramped quarters. 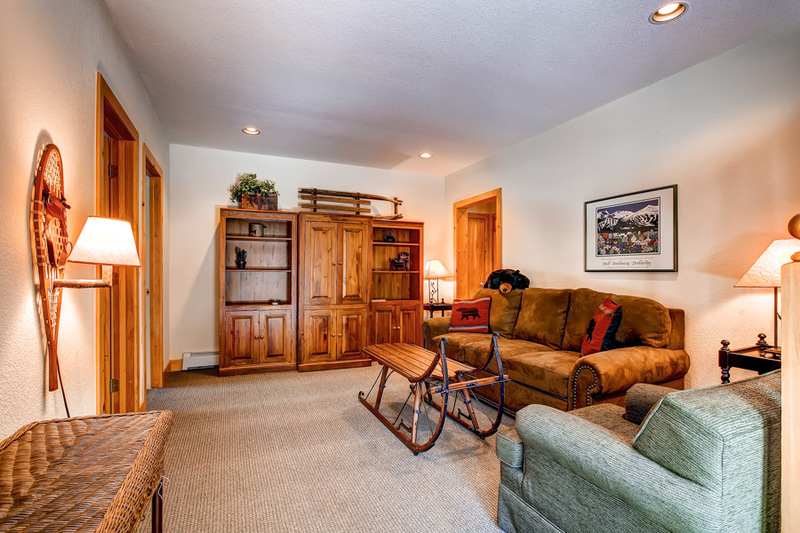 Easy access to the slopes and worth the little extra distance for all the we got with a 2900+ sq.ft. home. Very pleased!!! Everything was great except the hot tub was locked the first night. They did come and fix it by that evening. The location was beautiful and the townhouse was beautiful. I had a great time staying here. Location was good and the house had everything my party needed. 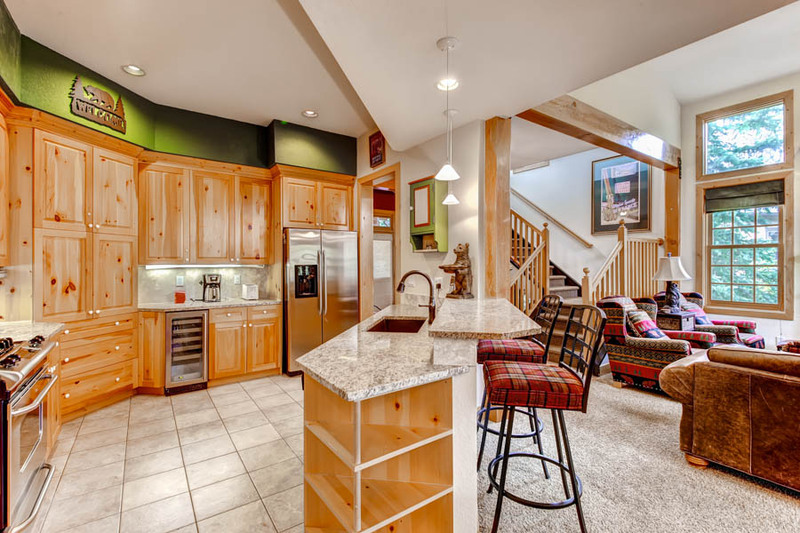 The property was perfect for our multi-generational family since it provided common space, but plenty of separate spaces to enjoy individual activities and care for children with different bedtimes, etc. 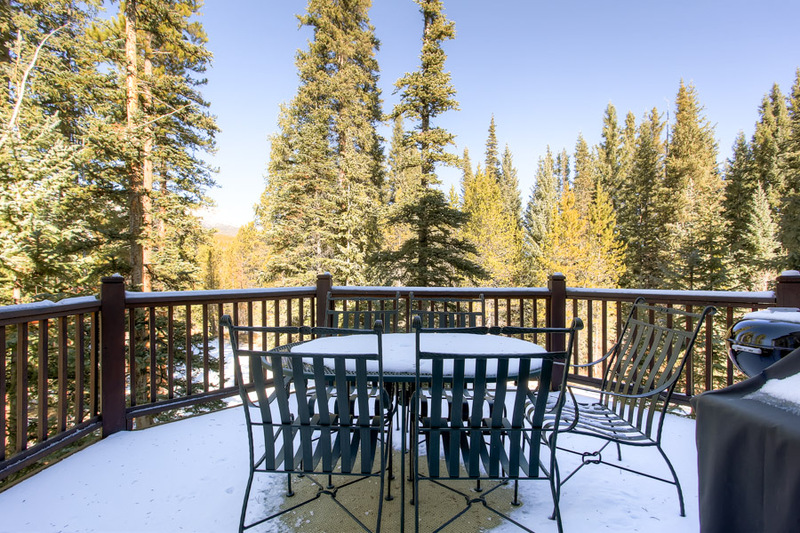 What a wonderful place to spend your days while visiting Breckenridge! The place was clean and well maintained. The management company was very professional and made everything very simple and straightforward. Many memories were made at WW 384 - highly recommended! Terrific. Needs new coffee pot like Keurig. Great place, great amenities, great location near the bus stop to the mountain and town. Would highly recommend for groups. 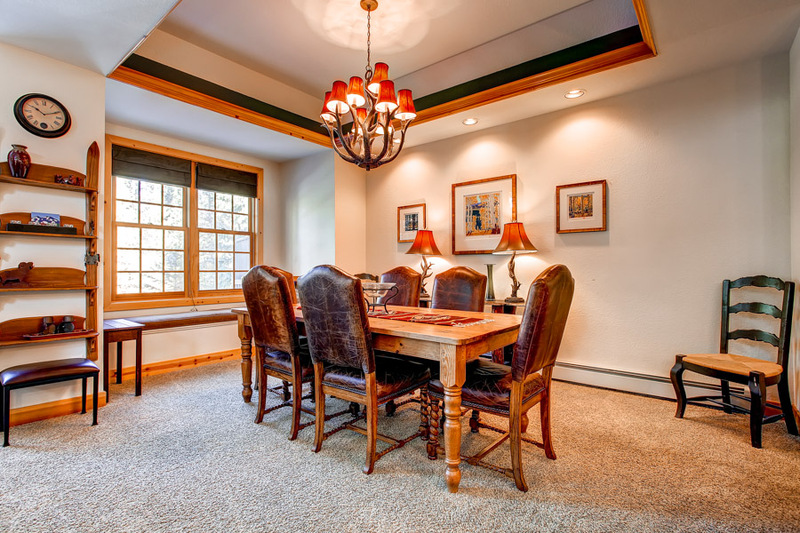 Very convenient location just 2 minutes walk from nordic center bus stop. Two minor issues were sorted out by Summit rentals with remarkable speed who were a delight to deal with. While the description of the property says it can sleep 12 a more comfortable number would be 8. There were 7 in my party and it was ideal. If there was anything that I could add to the property it would be a ski boot drier in the garage as it would save having to have the boots in the house each night. Wonderful, professionally decorated home. Had all the conveniences needed...well stocked kitchen, comfortable beds, newly upgraded carpet..will stay here whenever we can. We had an excellent stay. Very nice! Kitchen was equipped much better than any other place we have stayed before in the area. Plenty of bathrooms. Nice having private hot tub. Would definitely stay again in the future. I was very pleased with the rental process and the condo was great. I only wished it had more of a mountain view. 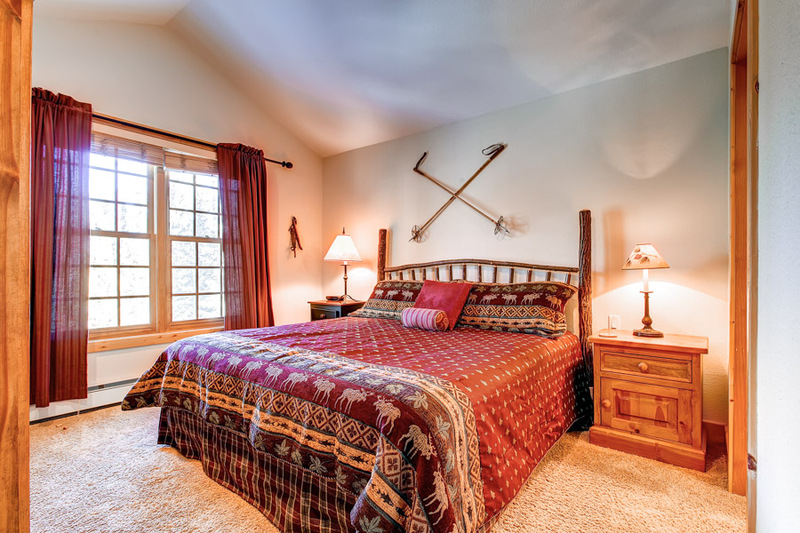 I would definitely recommend this place and if I visit Breck again I would look to rent it again. Property was perfect for two families to share. Beds were comfortable, condo was in good condition, and the location was convenient. Would definately stay here again. Very nice accomodations for 2 families. Got snowed in- suburban stuck - and it took a little while for the mgnt to help, but eventually they came. Overall, a great place!